When digital recording first came on the scene, many engineers had a difficult time making the switch from analog because the philosophy on how to record the cleanest sound had changed. The meters were different, for one thing, so setting the correct recording level was sometimes a question. Later when digital recording became more sophisticated and refined, the philosophy on how to get the the best sound changed yet again. Here's an excerpt from my PreSonus StudioLive Mixer Handbook that busts a couple of myths about digital recording levels as well as give a short history of how they came to be. "Over the years, some misconceptions about meter level readings have arisen which have left many confused on just what the correct level should be, so let’s bust a couple of myths. Myth #1: You have to record at close to 0 dB FS for it to sound good. For the most part, you do not have to record with the level close to 0 dB (the highest it will go before the red overload indicator lights) on today’s digital gear. If your signal peaks are between -6 and -10 dB or even lower on the channel meter, it will sound fine (see the graphic on the left). In the early days of digital recording, a meter reading close to 0 dB actually was necessary in order to keep the noise to a minimum because of the 8 and 16 bit resolution that was being used, but modern 24 bit recording no longer has this limitation. Myth #2: If I record at a lower level, the signal will be noisy. Again, this is untrue. You can easily record digitally at a lower level without directly introducing any noise into the recorded signal by the recording process. This myth actually comes from the analog tape days, where the magnetic tape medium itself had a level of self-noise in it. If you recorded too low, you’d begin to hear the tape noise, but that doesn’t happen in the digital world. Now what can happen is that if everything you record is at -30 dB, you’ll have to increase the gain somewhere later when you’re mixing, and that may introduce some noise and you won’t be taking advantage of the digital medium’s dynamic range. Because StudioLive is a digital mixer, you can actually almost get away with doing this, which isn’t possible in the analog world. Still, if you keep the levels in the -10 to -6 dB range, you’ll have the best of all worlds, with lots of level, dynamic range and headroom." 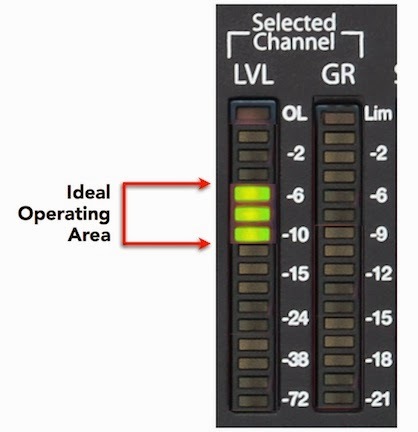 Don't forget that the above applies to recording levels only. It's most likely that these levels will need to be boosted in the mix or at mastering, although it's always a good idea to be conservative with your levels (let the mastering engineer do the boosting). Also, take a look at this post regarding the new loudness measurement standards. You can read additional excerpts from the PreSonus StudioLive Mixer Handbook or my other books on the excerpts section of bobbyowsinski.com. Now, I use the K-scale system... generally record with the -20 scale(more headroom), and then mix with the -14 scale... levels work great for broadcast. The level I record at almost ALWAYS needs boosting for the final mix. Great read! The biggest problem I have to deal with when receiving sessions form clients who hire me to mix is that more often than not there's no headroom. In manny cases the clients lives in the old world where they've pegged the meters around the 0. So usually I have to lower the gain to get some room to work.